Imagine if Get Out, Brazil, Being John Malkovich and Office Space got together, took peyote and tripped balls at a cubicle desk. While flicking between Norma Rae, YouTube vlogs, Jackass re-runs and Lindsay Anderson’s O! Lucky Man. Yeah, that comes close to what Riley has conjured here. Get Out and Atlanta’s Lakeith Stanfield is Cassius Green, a freshly recruited telemarketing drone going nowhere slowly at grandly named company Regal View. Supportive girlfriend Detroit (Thompson) is a local-store sign spinner, artist and activist against mega-corporation Worry Free. Liberally advertised on TV and billboards, Worry Free runs battery farm-like factories where cash-strapped workers have everything provided for them if they sign lifetime contracts. Cassius’ colleague Squeeze (Yuen) is organising a labour dispute against Regal, assisted by Cassius’ firebrand friend Salvador (Fowler). Matters are complicated when co-worker Langston (Glover) reveals telemarketing success is wrapped up in Cassius using his “white guy voice”. By doing this and, as his overbearing manager keeps insisting, sticking to the script, he is soon smashing sales records. This catches the eye of a mysterious Regal View power player (Hardwick) and opportunity comes calling. And life grows increasingly weird. 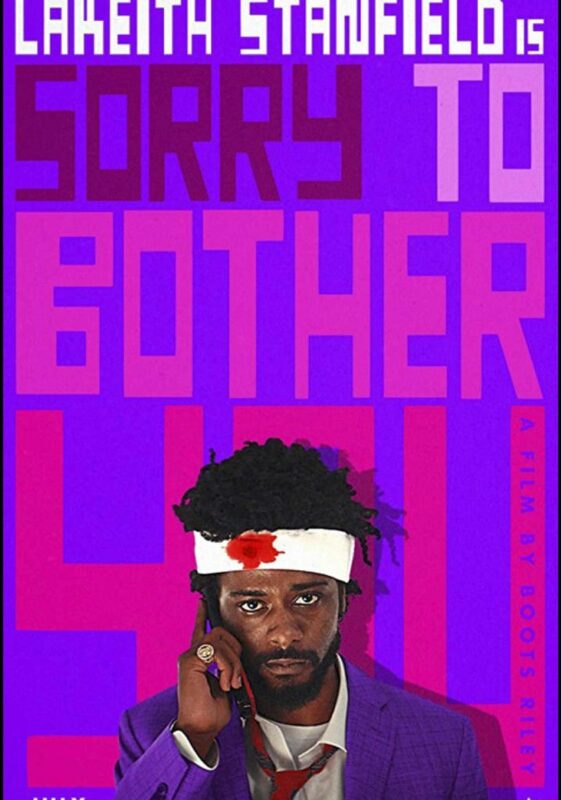 Sticking to the script is something Sorry To Bother You defiantly does, no matter the risks that the wilder plot kinks may buck the casual viewer. Not that Riley whacks out from the get-go. Beginning as an amusing slacker comedy, the movie skillfully shifts normality off its axis across the near-two hour run time. The weirder it gets, the clearer it becomes Riley is taking aim at today’s unreal reality, rapacious corporations, racial anxieties and a populace easily distracted by empty-calorie TV. The number one game show depicted here is likely to get commissioned as Channel 5’s Big Brother replacement. Just the concept of black characters speaking with reedy/plummy white voices would be enough to fuel the average indie comedy, but it is merely one thread in the film’s impressive tapestry. And it is amusing hearing David Cross’ distinctive voice emanate from Stanfield’s lips, or Lily James’ clipped British tones emerging from Thompson’s. Not everything lands, and Riley does hurl so many ideas into the mix you get the impression he thinks his first film may also be his last. But, he is confident in his his themes, and also his direction. Brightly coloured locations and sets (hats off to Production Designer Jason Kisvarday) garishly paint a world that is pretty on the outside, screwed up at its core. All pounding to the beat of an eclectic soundtrack, including tracks by Riley’s old hip-hop outfit The Coup. Oh, and the movie is frequently hilarious. A Regal View motivational seminar featuring Kate Berlant’s fantastically vacuous team leader is a delicious parade of hollow corporate speak. Cassius’ awkward attempt at rap and realisation of what his white audience expects to hear is viciously satirical. Even Cassius’ name is darkly ironic; for much of the movie he is clay molded by his situation as he attempts to fit in. While we’re at it, Worry Free is cuttingly double edged, worry being the only thing here that doesn’t cost money. There is something else here that is as funny as it is audacious, but we’re saying nothing more. Stanfield is magnetic throughout as a guy who tries to stay normal and play the game as rules are inexplicably rewritten, and his supporting players are equally accomplished. Including Armie Hammer as a CEO who is Jeff Bezos, Elon Musk and Steve Jobs in one devilishly handsome package. So, sorry to bother you, but we insist you sign up today for one of the most exciting debuts of recent years.